The J D Stewart Building is named in honour of the founding father of the Faculty of Veterinary Science. Largely complete in 1912 and finished in 1913 it is another Walter Liberty Vernon building in Federation Arts and Craft style. 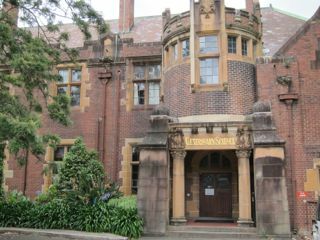 This was the first veterinary science faculty in Australia, where vets around Australia and even for a time New Zealand, learned their skills. Going round this to the back is the heart of the Faculty around a quasi-quadrangle. Beyond the Ross street exit to Parramatta Road is the area that was probably the site of some of the first buildings on ‘Grose Farm’, the farm buildings used for the agriculture and pastoral uses of the government in the 1820s. Under the now widened Parramatta road at this point are probably the foundations of the weir and other buildings marked on an 1844 map as Old Stockade that spread over towards what is now Arundel Street. The J D Stewart building was erected near the swamp extension of the Orphan School Creek and required deep foundations and much infilling. 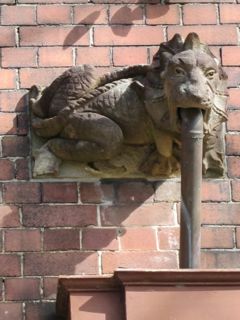 In the interwar period more buildings rose around what became a quasi-quadrangle behind the main lecture rooms, laboratories, dissection rooms and a museum and library, which have given way to offices but this is still the centre of Vet Science and the outside remains unchanged. 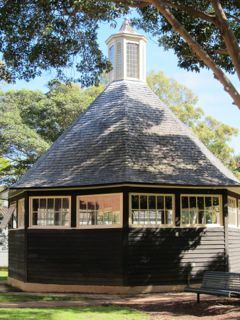 A heritage building that stands as the icon of the faculty, the Roundhouse, was built as an equine observatory by Leslie Wilkinson in the 1920s. Today there are several more separate buildings that house different aspects of veterinary work such as cats and dogs as well as a conference centre.